Let us design your perfect company or group outing. Based on your group size, activity interest and location preferences, we will craft an itinerary that will ensure a memorable experience. Whether a day in wine country, a walk in Yosemite Valley, a hike through coastal headlands, we can arrange fully-curated activities to suit your needs. From small team off-sites to large corporate outings, let us take care of the logistics so you can be with your team. Multi-day experiences? We can do that too! Read on for examples of trips we have arranged for companies and special-interest groups. A team leader at Salesforce contacted us to guide her team on a day-long excursion through the headlands of gorgeous Marin County. We scheduled a ferry trip across San Francisco Bay, guided them through a spectacular -- and challenging! -- hike along ridge tops with sweeping views of the Pacific Ocean, arranged a private lunch for the group at a waterfront eatery in charming Sausalito, and finished the day with celebratory social time at one of Sausalito's most popular restaurants. It was an easy way to get the team out of the office for the day with minimal transit, but maximum time to experience the outdoors, good food, good drinks and great times. We partnered with the Adventure Travel Trade Association to coordinate a 3-week trip to discover the hidden gems of California for a team of social media influencers. We took care of the field management for the project as we transported the team throughout a trip that covered over 3000 miles, and visited virtually every corner of the state. We partnered with operators on the ground to deliver exciting adventure travel experiences like zip-lining, dune buggy-ing, kayaking, rock climbing, white water rafting, wine tasting, horseback riding, and more. If you'd like to get off the beaten path with your group, we can create an itinerary that includes places you won't find in a guidebook! 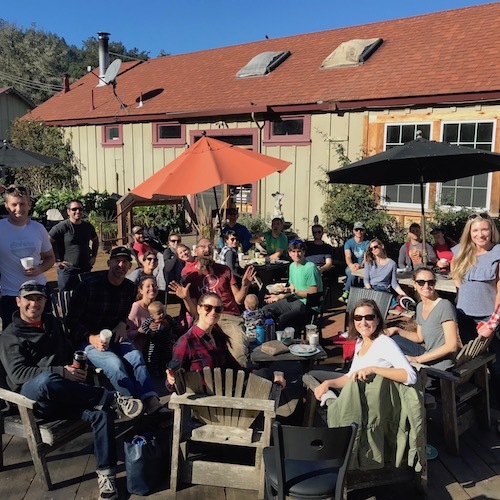 When group of CEOs from real estate firms all over Canada gathered in the Bay Area for their annual networking trip, they reached out to us to arrange an afternoon with a leisurely cycling option, exclusive wine tastings, and a meal at a top-rated restaurant in the Napa Valley. With them, we embarked on a mellow bike ride along quiet, vineyard-lined roads, were met with pastries from the famed Bouchon Bakery after the ride, delighted in a bountiful lunch at Bottega, and capped off the day with tours and tastings at two of Napa's premium wineries. Contact us to get started on your offsite or special interest trip today!